Crunchy and moreish poha chivda is a snack favourite from Maharashtra, savoury with a hint of sweetness, that is enjoyed around the nation. It is especially popular during Diwali when much sweet and savoury making commences at home for festive snacking and visiting guests. If you, like me, don’t have the time or inclination to deep fry indulgent snacks, then this easy recipe will help. 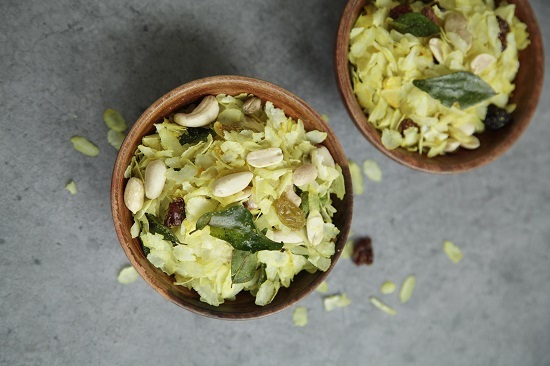 It’s a healthier toasted version with a handy bag of mixed nuts, and you can substitute the thin poha, flattened rice flakes, with puffed rice or healthy no sugar/salt rice cereal. Happy Diwali! In a wok or kadai, dry roast the nuts and raisins for a minute on medium heat. Tip them into a bowl and warm the ghee. When it’s warm, add the hing, curry leaves and turmeric powder. As the curry leaves sizzle up, stir through the rice flakes, stirring carefully for five minutes until they are crisp and the colour is evenly golden. Mix through the nuts and raisins, then add salt to taste and take off the heat. Leave to cool, then eat your poha chivda straightaway or store in an airtight tupperware/jar for up to a week.